The 2016 Honda Fit subcompact continues to be the standard-bearer for the subcompact class. With unparalleled versatility thanks to its so-called Magic Seat, excellent fuel economy and low price tag, it would already be a class leader. Throw in legitimate driving fun, and you have an act that's virtually unbeatable. Honda fit is a good fit for me! The fit is great on the highway, getting average 38 mpg. Compact but still feels roomy inside, plenty of backseat legroom even with front seats all the way back. Rear cargo area is deep and roomy with fold down seats to add more space. Love the touch screen Audio, very easy to use and also accessible from steering wheel. Appreciate the color guidance on gas usage and econ button for added fuel savings. Good acceleration for a small car. Right turn camera for better vision on turns as well as extra left hand mirror function for blind spot control. The best feature about the fit is the gas mileage! 200+ miles on 1 tank of gas! The Honda fit is very reliable. For someone like me who only has one small child it is very convenient and meets our needs. Surprisingly it has ample truck space so strollers, bookbags, and any other needs we may have day-to-day. It also has very excellent gas mileage. The only downside is there are 3 seats in the backseat but sitting 3 people is very uncomfortable. Other than that it is a perfect vehicle for small families, or college students, or anyone with a long commute. Reliable, easy to drive car. I love my fit. It is very reliable, and it gets great gas mileage. It is a great size. It is small and easy to fit in small parking spaces but it is also more roomy on the inside than you would think by looking at it. I also love the camera on the right side mirror. It is great for changing lanes on the highway. It made my move much safer when I had to drive with my car totally stuffed full as much that I couldn't see out the back. 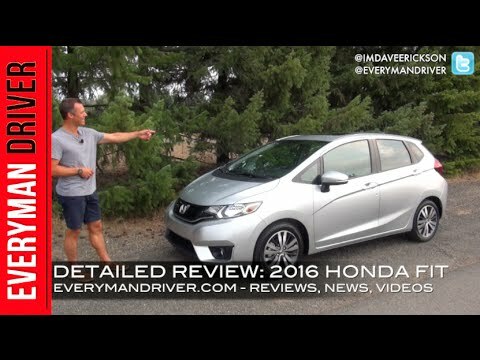 2016 Honda Fit Review - Is This The Greatest Hatchback Of Our Generation?